Dear readers, I am back from my travels, at my blogging post just in time for the first day of Spring. Artichokes are back in season! And is there any vegetable more typical of Roman cooking, perhaps of all Italian cuisine, than the artichoke? 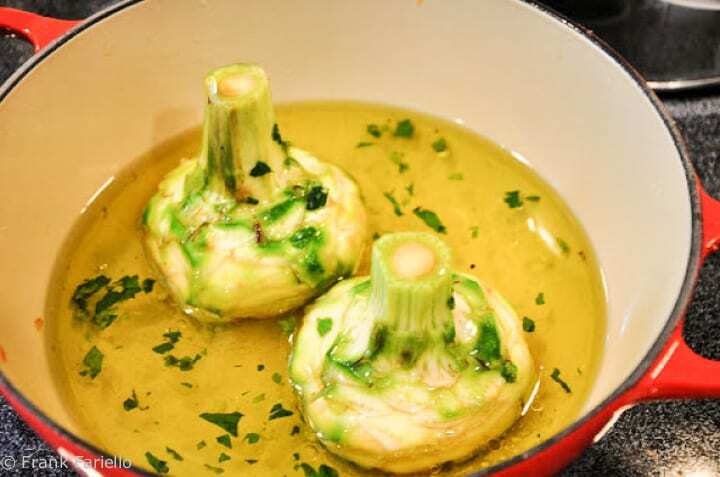 What better way to get back to work, then, than this dish, one of the most typically Roman ways to prepare artichokes called, appropriately enough, carciofi alla romana, or ‘artichokes in the Roman style’: stuffed with garlic and herbs, and simmered in olive oil and water. Nothing could be simpler, or more flavorful. Season with salt and pepper. (Although not part of the traditional recipe, I also like to add an extra sprig of mint and garlic clove to the liquid.) If you have any extra garlic-and-herb stuffing, you can add it to the liquid as well. Cover the pot and let the artichokes simmer for about 30 minutes. Check for doneness with a knife; they should be tender but not ‘mushy’. Allow the artichokes to cool before serving, moistened with a bit of the liquid. First, remove all the tough outer leaves from the artichoke. Beneath, you will find thinner, lighter colored leaves that you should leave on. Cut off the tip of the artichoke. Then, taking a very sharp, solid paring knife, begin to pare away the sides of the artichoke, starting from the wide base, holding the artichoke in one hand and rotating it as you pare away with the other hand, as if you were peeling an apple. Then, taking a spoon, scoop out the fuzzy core or ‘choke’ of the vegetable, including the thin, spiny leaves (often a dark purple color) that often surround the choke. Wash the artichoke well under cold running water to remove any of the ‘fuzz’ that tends to stick to the vegetable. Then cut off all but 3-4 cm (1-1-1/2 inch) of the stem, and pare away its tough, fibrous outer layer. All the while as you are paring the artichoke, you should make sure to rub it the exposed side of a lemon that you have sliced in two, to prevent discoloration. For a nice step-by-step visual guide to trimming an artichoke, see this article (the explanations are in Italian, but no matter: the photographs will show you the way). This recipe calls for the larger sort of artichokes known as ‘globe’ artichokes, known as mammole in Italian. When an artichoke is fresh, its leaves will cling tightly to the vegetable and show no sign of discoloration. Unfortunately, it is rare to find such fresh specimens in US markets (California, where most artichokes in the US are grown) might be the exception) but this treatment works well even with less than perfectly fresh artichokes. Slightly smaller artichokes will also work—and will cook in less time—but ‘baby’ artichokes will not. Carciofi alla romana are very versatile. They can be an antipasto, a secondo for a vegan/vegetarian meal or even a light lunch or supper. They are one of the two most typically Roman ways of preparing artichokes, the other being carciofi alla giudia, or “Jewish style” artichokes, which I will blog about soon. By the way, I never throw away the cooking liquid when you make carciofi alla romana. It is perfectly delicious and, although it is perhaps not very orthodox, I like to serve the liquid, too, at table, for dipping with nice crusty bread. Trim the artichoke of its outer leaves and choke (see instructions below). 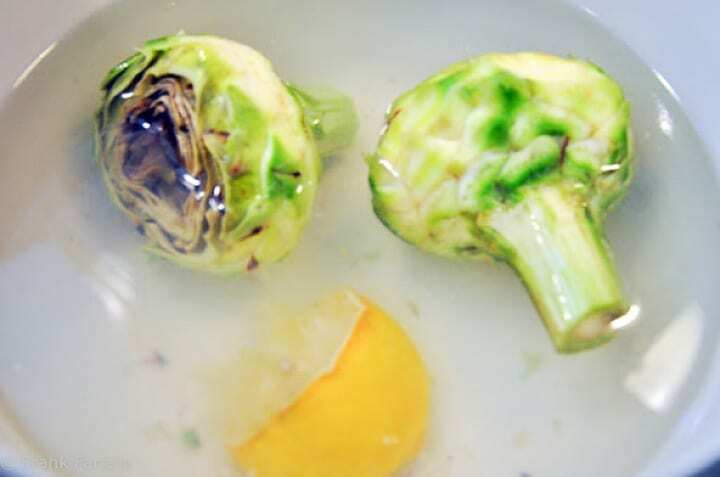 After you are through trimming, immediately drop the artichoke into a large bowl of water acidulated with lemon juice to prevent discoloration. Proceed in the same fashion with the rest of your artichokes. You are now ready to staff and cook your artichokes: Make a tritto of garlic, parsley and mint, mixed with salt and pepper and wet with a bit of olive oil. Stuff the hallowed out cores of the artichokes with this mixture. Then stand the artichokes up, stems upward, in a terracotta casserole or enameled cast iron Dutch oven or other heavy pot with tall sides. Add a generous amount of olive oil and then enough water to come halfway up the artichokes (not counting the stem). Season with salt and pepper. (Although not part of the traditional recipe, I also like to add an extra sprig of mint and garlic clove to the liquid.) If you have any extra garlic-and-herb stuffing, you can add it to the liquid as well. Cover the pot and let the artichokes simmer for about 30 minutes. Check for doneness with a knife; they should be tender but not 'mushy'. Please, could you tell me whether I can make them a day ahead and keep them in the fridge, for let’s say, 24h before serving? Thanks for your message, Silvia! And for your kind words. 🙂 About the artichokes, I don’t see why you couldn’t make these ahead. And since they are essentially braised, an overnight rest might even improve their flavor. Thank you so much for this recipe as I thought I would never learn the secret. I worked for seven years with Technip Italy, alternately in; Qatar, Saudi Arabia and Canada as a Safety Manager. Once a year there was a workshop at the Rome Headquarters. Yes, you guessed it, there was plenty of eating in the evening, and this was one of the most memorable dishes that I tasted. It brings back fond memories of both friends and Italian cuisine. That’s fantastic, Tim. Glad I could bring back those memories for you—and let you make the dish yourself if you want! I tried carciofi alla romana last week after ordering it a restaurant. It was good, just that I needed to trim off more leaves. Thanks for the link to how to clean an artichoke. Very useful. Thank you for this lovely blog! As a lover of food and food styling, I greately enjoyed the contents! Absolutely beautiful dish… no two ways about it! So good – things that require a bit of extra work, like artichokes, offer up big rewards! @Ruth: Unfortunately, I never got to Modena in my travels, although I've been to Bologna (of course) and Parma. @Francine: Ice cold is definitely not the best way to enjoy this dish… it dulls the taste. Roome temperature or lukewarm is best. Mmmmm, that sounds delicious! I cook artichokes quite often (hence the name of my blog! ), but I've never tried adding mint to them. I usually serve the lovely oily artichokey liquid to dip bread into as well! I can't wait till the artichokes in our garden are ready in about six weeks' time, I hope. When I was in Roma at Christmas time Carciofo Romana were on the menu and I was thrilled to order one. I was disappointed, tho, because it was served 'ice' cold right of of the fridge. Not even room temperature. From your recipe I think they should be served warm or at least room temp, no? Another way of doing them is in the oven with a carciofo di cima, excellent! A bit more expensive with this type of artichoke but its worth the little but more, and is also a Roman way. I am headed to California soon and can't wait to have fresh artichokes; nothing better! This post is perfect for me. I am surrounded by artichokes. I face them on a daily basis and they terrify me, simply because I have no idea what to do with them. Not only does yours look amazing but you actually given me instructions on how to prepare them. Phew!! Since you mention the market in Rome, curious to know if you have heard of the Mercato Coperto in Modena. I love it!! Hope you had a lovely trip. I am a cheapskate and always steam and scrape the leaves and use them in sauteed potatoes… they are so good with a little duck fat and then I don't feel so bad tossing all those perfectly good leaves! Artichoke is one of vegs that I love to cook at home, and your post inspires me to go ahead now. Thank you from Tokyo!! welcome back,i never ate artichoke,i didn't see it at the market .your dish looks gorgeous! One of the things I miss about living in Rome is the large variety of artichokes. Yours look fantastic. I’ve been looking for a recipe for Roman-style artichokes since we visited Rome this past January. They were in season and I had them every day. Going to give this a try today.